The long-awaited first real album from Imprecation resembles less their 1995 debut Theurgia Goetia Summa but a more streamlined and moody creation. 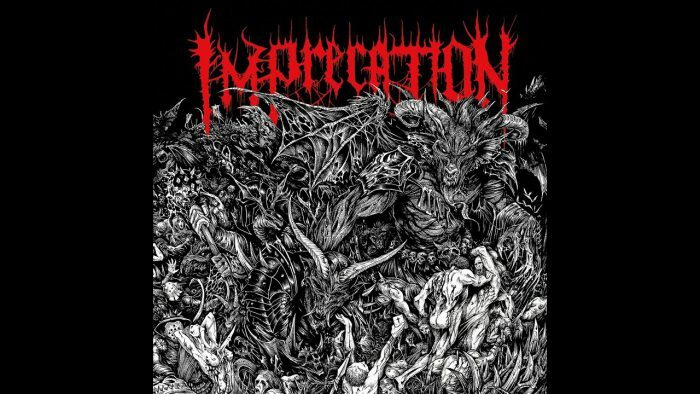 While the demos compiled into that album revealed a raw understructure of a morbid subconscious arising, the newer work from Imprecation focuses on deliberate and meticulous ritual. Shifting from a predominantly fast-riffed approach, Imprecation meld 1980s-style speed metal back into their death metal. Satanae Tenebris Infinita use extensive palm-muted downstrumming to carry riffs that are less phrasal than previously, and as a result are less distracting from the vocals and their integration with drums and (occasional) keyboards. IN addition to speed metal influences, riffing reveals the Slayer tendency toward angular riffing and an enmeshment with riff forms from earlier death metal. While songs break to fast riffs, and vary standard song structure on a regular basis, the majority of the work here is mid-paced death metal with melodic underpinnings. In old school metal style, riffs start out simple and run into contrasting riffs, which fit together by relationship of riff shape and the emotions evoked. Songs later pick up on earlier themes and conclude; this patterning is reminiscent of early Celtic Frost. Lead guitars appear like schools of fish in twisting metallic sounds that dissipate into the dark surroundings. Satanae Tenebris Infinita shows a band mastering their riff-craft and intensity of their earlier work by adding layers of dark moods, combining several genres of metal to produce a mid-paced death metal epic with the emotional depth of doom metal or early Metallica. The result resembles a ritual descent into an occult netherworld, and achieves the suspension of reality for which death metal is famous, filling the void with a world of grotesque beauty and raging death metal energy.